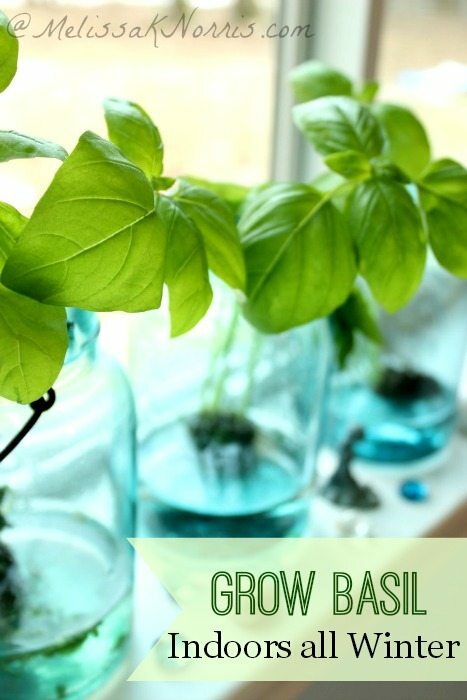 Grow Basil Indoors Without Dirt All Winter! I don’t know about you, but I cringe every time I see a $6 price tag on a bottle of organic (or not organic) dried herbs at the grocery store. Know why I cringe? Because I know how easy and frugal it is to grow your own herbs at home. What’s this you say, you have no garden space? You don’t have time for a garden? Even if you don’t have a green thumb or time for a garden, you can have a mini-herb garden in about ten minutes, with very little upkeep. And, not only is it spending less, but it’s living better, because fresh home grown vegetables and herbs have more nutrients in them than store bought or even farmer’s markets varieties. One of the easiest herbs to start with and the most used in my kitchen, is basil. Fresh basil on top of homemade pizza, chopped up and thrown into scrambled eggs or an omelet, meatballs, soups, and of course spaghetti are just a few ways to use basil, oh, and pesto, how could I forget pesto? I grow chives, mint, chocolate mint, lemon balm, oregano, and rosemary outside mixed among my flowers and in some large pots. They’re great perennial herbs (you don’t have to replant every year), but basil and thyme are some of my favorite warm weather annual herbs. 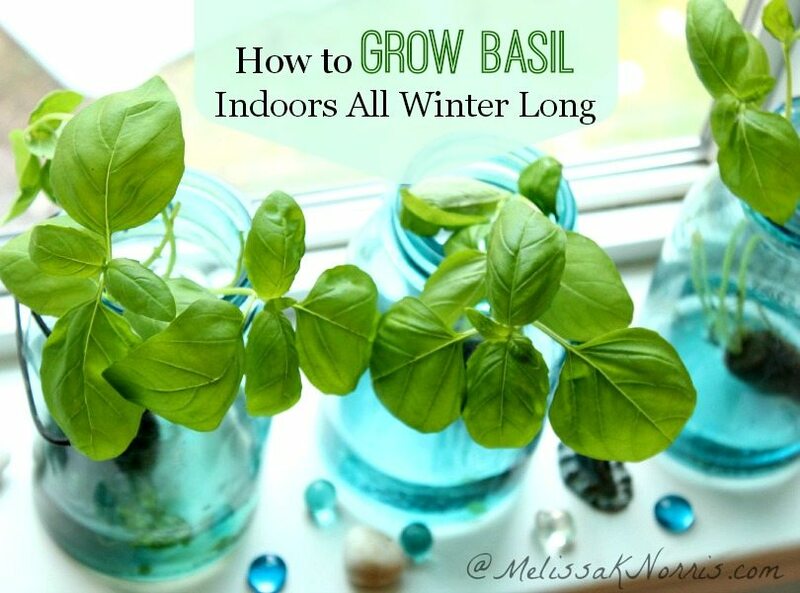 If you live in a really mild climate with warm weather year round, you might be able to keep basil outdoors, but here, we frequently dip down into the teens during the winter, so it’s not an option. Never fear, no matter how cold your climate is, you can have year round herbs via a windowsill herb garden. And, are you ready for this, you can grow basil without any dirt! Have you ever been at the grocery store and seen those little packages of living basil? Both Safeway and Fred Meyers carries them. Step 1: Buy one or two bunches of basil (usually about three plants are inside each package). Growing basil in water during the winter months is actually preferable, as you don’t have to worry about your soil molding. But I don’t know how much longer these will be available as they were only made as a limited edition. Step 4: Place your basil plants in the water. Find your warmest and sunniest window, usually this is a southern exposure side of the house. Because your plants have been inside a store with very little sunlight, don’t be alarmed if they leaves seem wilted and shriveled the first few days. 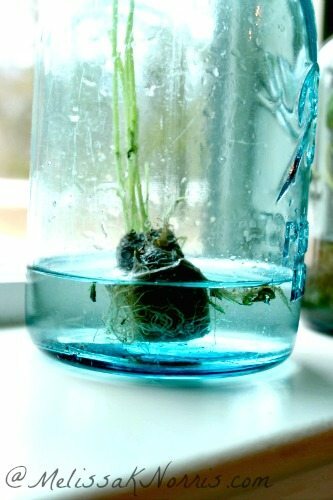 Place the plant in the window and wait a week. All but one of mine perked up after some TLC in the sunlight. Be sure you don’t place the basil against the glass or allow the leaves to touch it. The glass will be quite a bit cooler than the air and can kill the plant, especially during night time temps. If an exceptionally cold night is in the forecast, you should move your plants out of the window sill onto the counter where it’s warmer overnight. Replace the water about every week or two. Once your basil is doing well in it’s new home, you’ll want to harvest it. Now, harvesting basil isn’t hard, but here’s a few tips to ensure the continued growth of your herbs. Contrary to what you’d think, leave the large bottom leaves of basil on the bottom alone. These are what feed your plant. Once you’ve got pairs of leaves at the top of your plant in a few tiers, pinch off leaves directly above a pair. This will cause two new shoots to grow, creating more leaves, and a bushier stronger plant. If you’re using fresh herbs in a recipe that calls for dried herbs, you’ll need to use three times the amount of fresh herbs the recipe calls for. Have an over abundance of your herbs and want to dry them to give as gifts or to preserve for later? Here’s how to dry your own herbs at home. Is learning how to grow your own food, cook from scratch wholesome food, and slowing down something you want for you and your family? Me, too! Do you grow any of your own food at home? What are some of your favorite ways to use herbs?